Lower the lighting control stalk fully when moving to the left. Raise the lighting control stalk fully when moving to the right. If you forget to cancel the direction indicators for more than twenty seconds, the volume of the audible signal will increase if the speed is above 40 mph (60 km/h). 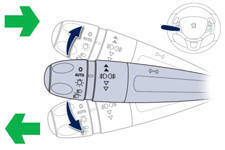 Move the stalk briefly upwards or downwards, without going beyond the point of resistance; the corresponding direction indicators will flash 3 times.